The Music Maker multimedia players and learning centers provide flexibility and durability for read-alongs, individual or small group instruction as well as amplified audio for an entire class of up to 75 people. Whether used for sustained silent reading or phonics activities, the Music Maker supports music and movement activities, phonemic awareness, comprehension, vocabulary, literacy groups, ELL, ELD and other language learning programs. 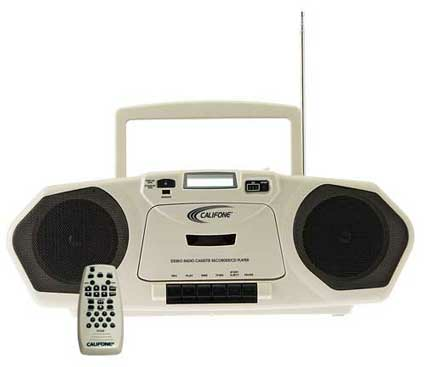 The MP3-Capable Music Maker is a single cassette multimedia player which can play CDs with MP3 files or audio files duplicated from original content which have been converted from wma or wav formatted files. 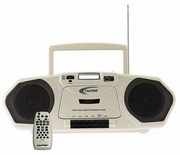 Features a 20-track programmable CD player, AM/FM radio, and cassette player/recorder with a built-in microphone to record student responses and presentations. Each Music Maker has a jack for connecting a headphone or jackbox for multiple listeners and two ¼” jacks to connect external speakers for a wider broadcast. Whenever a headphone or jackbox is connected, no audio plays out of the speakers. Each player is built from rugged ABS plastic (which won't shatter into potentially dangerous shards if it falls, unlike consumer electronics items) to withstand the rigors of daily school use. All three have recessed speakers protected by metal grilles to prevent accidental damage in busy classrooms. The Music Maker is available as 4-Person Learning Centers with four included stereo headphones and a ten-person stereo jackbox with individual volume controls. The Infrared Music Maker Plus comes as a Learning Center with six wireless headphones (no jackbox is necessary) and is expandable as additional students can be added with infrared headphones. Weight 8 lbs., without batteries, shipping weight 12 lbs.